Roxy Squires, better known as "Foxy Roxy", hasn't had a job in the entertainment industry for a while - though not for lack of trying! She makes sure to keep her tan orange, her clothes as minimal as possible and her teeth unnaturally white, so she looks her utter best when the next presenting gig comes along. In the main time she blags herself into the VIP areas of the hottest clubs so she can leave through the not-so-secret back exit and pose for the paparazzi. There is little Roxy isn't willing to do to reclaim her celebrity status. Woody is a former pop star and heartthrob who abruptly disappeared from the scene when he was at the height of his fame. Imagine Roxie's surprise when she finds out that 'The Woodeniser' nowadays works as a window cleaner in her otherwise rather dull village of Lavender Heath. The former teen idol still looks very appealing to the eyes and despite his 'civilian' job Roxy fancies him madly, so she eagerly replies to his invitation to drop by his house. 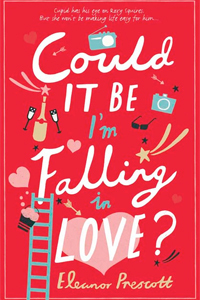 While she assumed this to be a date he actually thinks she's the perfect candidate to join his group of celebrity has-beens, which also includes a soap actor desperate to show his talents in a rom com, a child prodigy, and a weatherman who never managed to actually predict the weather. Each one of them has left the spot light for one reason or another and while they not all desperately want to get back in it, they do find it difficult to adjust to their current lives. The meet-ups are an opportunity for them to vent their frustrations and along the way unlikely friendships are formed. I loved the supporting characters we slowly got to know through these meetings; Holly, Cressida, Simon, Sue and Terrence are brilliantly unique and I really wanted to learn more about them. Even Austin and Chelle started to grow on me towards the end. It was a shame that the one person the book was heavily focussed on was the one that got on my nerves for the majority of it. Roxy is superficial, egocentric and quite frankly annoying. I didn't warm to her until the very end, when she finally became more grounded and there was some much needed character development, and more than once did I wish the novel was focussing on one of the other characters instead. It did redeem itself in this final part by not only making Roxy more relatable but also by revealing a great twist, which made this not an average run-of-the-mill chick lit but gave the story much needed padding and intrigue. Overall I would give Could It Be I'm Falling In Love? 3 stars as despite the fun premise, great twist and my overall enjoyment of the final third of the novel, my frustrations with the main character remained consistent until almost the very end. Many thanks to Quercus for a copy of the novel in exchange for an honest review!